COMPASSIONATE CLIMATE ACTION: 52 Days - Will Copenhagen End Up a Commitment to Catastrophe? 52 Days - Will Copenhagen End Up a Commitment to Catastrophe? 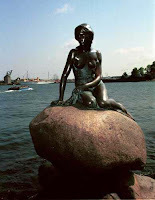 I've written before that Copenhagen is becoming more famous for the upcoming United Nations Framework Convention on Climate Change talks it will host this December than for its Tivoli Gardens, the Little Mermaid statue, and Carlsberg beer. This will be the most important meeting in the history of humanity (and I'm not the only one to say that), but things aren't looking good. Will Copenhagen — the climate meeting — soon become synonymous with disappointment? With betrayal, greed and selfishness? With looming catastrophe? If so, it will be a real shame. Because Denmark is doing so many things right. Indeed, if I were Copenhagen, I would call off these talks, because they are likely going to lead to nothing but heartache and a worse-than-nothing agreement, if we stay on the same path. For example, how can Obama only pledge to return US emissions to 1990 levels by 2020 when the European Union has its sights on 20% below 1990 levels or more? And when the future needs us to get to zero carbon emissions as quickly as possible? Sheesh. In the Globe and Mail's "Denmark Makes You Green with Envy" by Gary Mason, we learn that ... well, I think I'll just leave you with some excerpts, and the suggestion that you do all you can to encourage your national leaders and negotiators to please, please put the children — and not the economy — at the centre of their talks and decisions. While much of the world talks about the problem, the Danes are finding solutions..
...You don't need to spend much time in the Danish capital to realize how seriously the people here take climate change. It is probably no coincidence that the next big important conference on the issue will be held in Copenhagen in December. While much of the world talks about the problem, the Danes are finding solutions. How about this stat: The Danes use about the same amount of energy today as they did in 1980. But over that same period of time, the country's economy has grown by 70 per cent. A tighter focus shows that from 1990 to 2007, economic activity in Denmark grew by 45 per cent while carbon-dioxide emissions were reduced by more than 13 per cent. Denmark has become synonymous with wind energy. It accounts for 20 per cent of the power generated in the country. Now, the Danes are selling the technology throughout the world and getting rich doing it. The biggest wind-turbine manufacturer in the world, the Danish giant Vestas, can't fill orders from China and India fast enough. Danish exports of energy technology stood at about $13-billion in 2007. ... Fifty-five per cent of people living in Copenhagen (population 550,000) ride their bikes to work every day. City officials have estimated that people cycle 1.2 million kilometres, seven days a week. That's 30 times around the world every day. No wonder you can't find a fat person anywhere. Denmark is the most energy-efficient country in Europe. By 2020, 30 per cent of its energy supply will come from renewable sources. All household waste is incinerated to generate heat and power. In Canada, incineration still conjures up images of the technology that hasn't existed in decades. ...Of course, the focus on reducing CO2 emissions had to have come at a brutal cost to the economy. At least, that is what's supposed to happen, isn't it? Somehow it didn't here. Denmark has one of the strongest economies in the European Union. Unemployment is 3.7 per cent. You read that right. Danish politicians are different too. They're not afraid to impose taxes to discourage people from driving their cars. A litre of gas costs twice what it does in Canada. Almost half of the cost is tax, which the government collects and uses, in part, to help fund green innovation research. ...I could go on, but I'm sure you're sick of hearing about the virtuous Danes. In any case, the greenest country on the planet doesn't really care if you're applauding. The people here figure you'll be joining them soon enough. They're just getting a head start. By the way, happy Blog Action Day 2009. It's devoted to climate change this year, and Compassionate Climate Action has joined with thousands of other blogs and bloggers around the world today to focus attention on this issue. Natural Laws are not able to pardon us, for creating carbon dioxide overloads, with our Black Magic Life$tyle. Because we so enjoy the creature comforts we create with the powers of fire, our planet will become as desolate as Mars; much sooner than Nature intended. Weakling humans, that sensationalize encasing ourselves in 4000 pounds of steel, glass, rubber, and plastics, for our ride to the theater, will die off quickly; unable to endure the future harsh consequences of our B. M. Life$tyle. We have gained partial control of our living environments now, thanks to life's 3 billion year struggle. In cosmological time, life on this planet has only just recently risen from the primordial mud in which it was conceived. Because we are a young species, human greed, the need for conformity to beliefs, and the ostracism of diversity, is apprehensible. Humans are now poised to fail, reversing the tenacious advance of life, and fall; back into the proverbial mud. We will survive global warming only long enough to experience the comparatively mild beginnings of the permanent damage our species caused, to this one of a kind space ship that all life shares. . . our biosphere. We are choosing to wither and perish, along with all the other higher life forms. Humans have created conditions that humans will not survive. We blame and evade our own personal re$pon$ibility for this imminent disaster, rather than avoid it, by demanding the development and implementation of plans and processes to accomplish the removal of the excess atmospheric and oceanic carbon dioxide, and other hazardous conditions, that we have created. As in driving over a cliff, just slowing down will not avoid the eventual fall. Only by REVER$ING the flow of CO2, out of, rather than into, our environment, will we avoid going too far passed the invisible tipping point; the one we are being told is still a ways off, somewhere in our future. TALKING, about making cut$ in greenhouse gases is a tactical ploy, the creators of these gases use, to avoid making real life$tyle changes. Con$umer demand creates greenhouse gas. Turn it down, or off; and STOP buying more greenhouse gas[oline]! Denying our real re$pon$ibility by blaming our $capegoat leaders, for not making our tough choices, ensures the worst possible consequences. Without public demand for better solutions than reductions. . . the answer to the global warming question, will be a nuclear winter. Our planet's temperature is rising as it develops a fever to combat a viral infection. Destruction of the natural environment by humans will end, here on this dying planet, as we create our own hideous extinction. Our love of power, $trife, and conquest, will not spread throughout the galaxies. The Universe will be left in peace. . . once again. Thank you for your eloquent take on the future of our species. I like the idea of the Universe being at peace once again. Guess you're not into that hope thing either, eh? Hope is very tired now, after all these years, how about some Forgiveness instead? These ingredients, and directions for use, may vary with your imagination. 1 Accidents do happen, and sometimes we break things, or hearts, unintentionally. 2 It can be much easier to make mistakes, than it is to admit and correct our mistakes. Are you the first one to make this mistake; would you want to be the last one? 3 When you make, or find your mistake, sprinkle just enough of this "Forgiveness" on it to mark it plainly as yours, and prevent the cat, or anyone else from being blamed. 4 Leave the mistake in plain view until everyone sees you prefer to deal with it honestly; and honorably accept the responsibility for it. 5 Mistakes may pay for themselves more fairly through exposure; we waste a potential benefit of our mistakes by hiding them. 6 By sharing the gift of our mistakes with others, we may help them to make more uplifting choices. 7 Concealing a mistake may cause many other mistakes, even more difficult to correct. 8 The value of mistakes is in understanding the lessons they are trying to teach us. 9 Genuinely participate in discussing how to avoid making this mistake again. Ask for and get any help you need. 10 Forgiving ourselves, may prove to be the most difficult part of making a mistake. 11 We may find forgiving our own mistakes easier with practice, forgiving the mistakes of others. 12 Forgiveness feels good, whether it is given or received. 13 The unforgivable; fail to ask, accept, or give their Forgiveness. Enthusiasm, Courage, and Hope, along with Forgiveness? Novel approach to combat global warming. I put many discarded and broken mirrors on my roof. These mirrors reflect thousands of watts of solar energy back into space, thereby causing an infinitesimal reduction in global warming. They also help keep my house cooler during the hot desert summers. If people put all available mirror material on their roofs, the reduction in global warming might be a little more than infinitesimal. Please, be re$pon$ible in such placement, do not let the morning or evening sunlight reflect off your mirrors into your neighbors windows, or into vehicular or air traffic routes. This is another way to become part of the solution. Another is to demand atmospheric and oceanic carbon dioxide removal techniques be chosen, developed, and implemented to offset 150 percent of our emissions. Without your demands, governments will not be timely in their efforts to reduce the rate of global warming. Governments ignore, deny, promote controversy, and protect special interests; rather than do what needs to be done to reverse global warming.